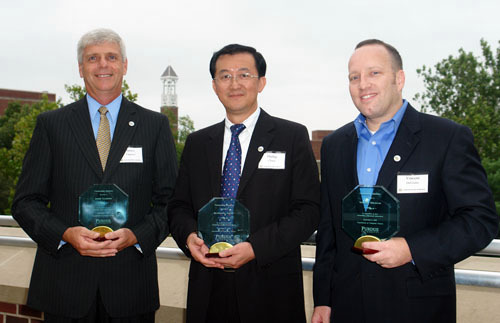 2008 Outstanding Alumni (from left to right): Jim Clamons, Phillip Chung, and Vincent DeGiulio. The Computer Science Department honored 2008 CS Outstanding Alumni Award recipients, "Phillip" Ke-Hsiung Chung, James Clamons, and Vincent DeGiulio, on Friday, September 5. Recipients of this award have shown exceptional professional achievements and great success in advancing world technology during their career. In celebration of this honor Chung, Clamons, and DeGiulio visited Purdue for the awards presentation. CS Department Head, Aditya Mathur introduced the CS Outstanding Alumni to faculty, students, and staff then presented them with engraved awards. Chung, Clamons, and DeGiulio also meet with CS faculty, took a tour of the Lawson Building, and had breakfast with Interim Dean of the College of Science, John Harbor, during their visit. "Phillip" Ke-Hsiung Chung of Taipei, Taiwan, is a retired Army Major General for Taiwan and vice president for MiTAC International Corp., an electronics and computer company based in Taiwan. Chung served as provost of National Defense University in Taiwan and was named a major general in 1997. He retired from the Army in 2001 and took his position at MiTAC. Chung earned his bachelor's degree in electrical engineering from the National Defense University in Taiwan in 1974 and master's in information and computer science from Georgia Tech in 1986. He earned a doctorate in computer science from Purdue in 1993. James Clamons, vice president of engineering for the government communication systems division of the Harris Corp. in Melbourne, Fla. Clamons has volunteered his time to the Palm Bay (Fla.) High School's academy advisory board and its FIRST Robotics team, Brevard County Habitat for Humanity, Hacienda Girls Ranch, Royal Palm (Fla.) Charter School, and Florida State University advisory board. He earned his bachelor's degree in mathematics in 1975 and master's in computer science in 1977, both from Purdue. He volunteers as a corporate partner in Purdue's computer science department. Vincent DeGiulio of Chicago, is a senior executive at Accenture, one of the world's largest technology services firms. He is part of Accenture’s systems integration practice specializing in delivering large-scale, custom technology solutions to clients. He has spent more than 21 years designing and implementing technology solutions to support his client's core operational processes. DeGiulio joined Accenture (known as Arthur Andersen at the time) in 1987 after receiving his bachelor's degree in computer science from Purdue.